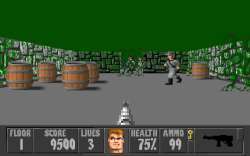 This Wolfenstein 3D standalone mod has 45 levels, 40 straight and 5 secret. Maps are mixed between new ones from October '11 to March '12 plus some of the best from Overkill. There are a number of graphics changes but the Wolf3D feel remains. Very well designed.